Nicknamed the "replicator" by the inventors—after the Star Trek device that can materialize any object on demand—the 3-D-printer can create objects that are smoother, more flexible and more complex than what is possible with traditional 3-D-printers. It can also encase an already existing object with new materials—for instance, adding a handle to a metal screwdriver shaft—which current printers struggle to do. "I think this is a route to being able to mass-customize objects even more, whether they are prosthetics or running shoes," said Hayden Taylor, assistant professor of mechanical engineering at the University of California, Berkeley, and senior author of a paper describing the printer, which appears online today (Jan. 31) in the journal Science. "The fact that you could take a metallic component or something from another manufacturing process and add on customizable geometry, I think that may change the way products are designed," Taylor said. Most 3-D printers, including other light-based techniques, build up 3-D objects layer by layer. This leads to a "stair-step" effect along the edges. 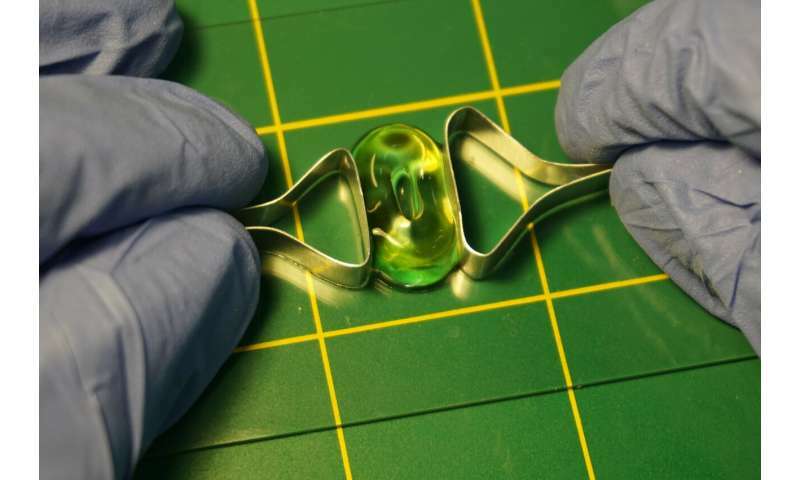 They also have difficulties creating flexible objects because bendable materials could deform during the printing process, and supports are required to print objects of certain shapes, like arches. The new printer relies on a viscous liquid that reacts to form a solid when exposed to a certain threshold of light. 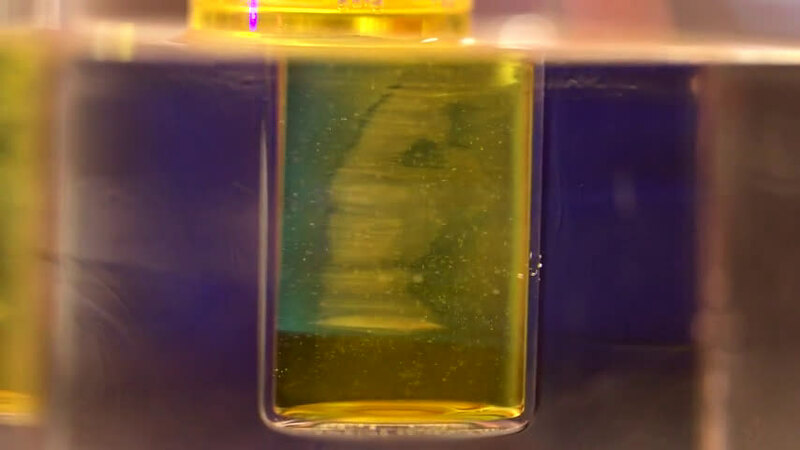 Projecting carefully crafted patterns of light—essentially "movies"—onto a rotating cylinder of liquid solidifies the desired shape "all at once." "Basically, you've got an off-the-shelf video projector, which I literally brought in from home, and then you plug it into a laptop and use it to project a series of computed images, while a motor turns a cylinder that has a 3-D-printing resin in it," Taylor said. "Obviously there are a lot of subtleties to it—how you formulate the resin, and, above all, how you compute the images that are going to be projected, but the barrier to creating a very simple version of this tool is not that high." Taylor and the team used the printer to create a series of objects, from a tiny model of Rodin's "The Thinker" statue to a customized jawbone model. Currently, they can make objects up to four inches in diameter. 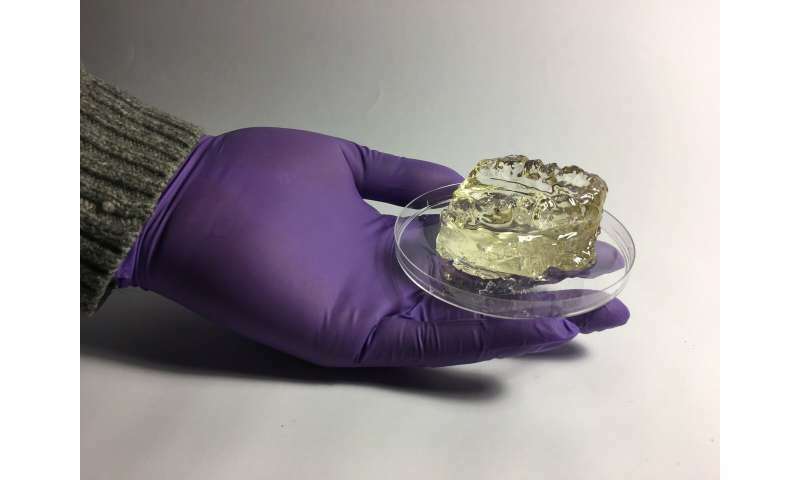 "This is the first case where we don't need to build up custom 3-D parts layer by layer," said Brett Kelly, co-first author on the paper who completed the work while a graduate student working jointly at UC Berkeley and Lawrence Livermore National Laboratory. "It makes 3-D printing truly three-dimensional." "Essentially we reversed that principle," Taylor said. "We are trying to create an object rather than measure an object, but actually a lot of the underlying theory that enables us to do this can be translated from the theory that underlies computed tomography." "The liquid that you don't want to cure is certainly having rays of light pass through it, so there needs to be a threshold of light exposure for this transition from liquid to solid," Taylor said. 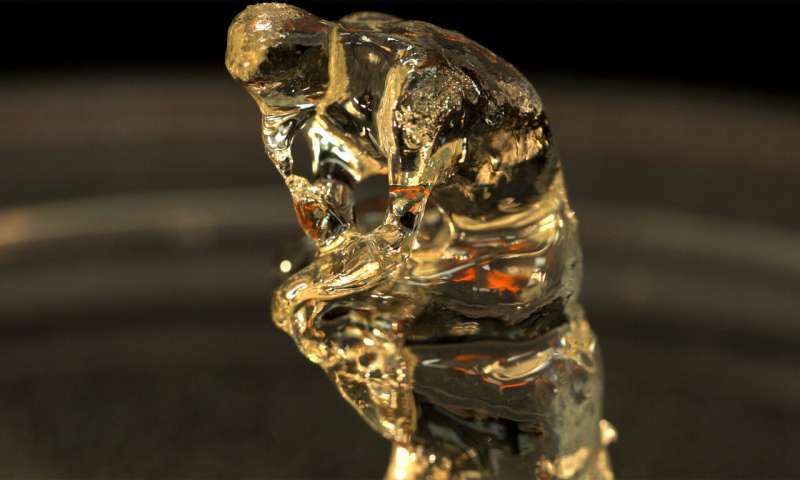 The 3-D-printing resin is composed of liquid polymers mixed with photosensitive molecules and dissolved oxygen. Light activates the photosensitive compound which depletes the oxygen. Only in those 3-D regions where all the oxygen has been used up do the polymers form the "cross-links" that transform the resin from a liquid to a solid. Unused resin can be recycled by heating it up in an oxygen atmosphere, Taylor said. "Our technique generates almost no material waste and the uncured material is 100 percent reusable," said Hossein Heidari, a graduate student in Taylor's lab at UC Berkeley and co-first author of the work. "This is another advantage that comes with support-free 3-D printing." The objects also don't have to be transparent. The researchers printed objects that appear to be opaque using a dye that transmits light at the curing wavelength but absorbs most other wavelengths. "This is particularly satisfying for me, because it creates a new framework of volumetric or 'all-at-once' 3-D printing that we have begun to establish over the recent years," said Maxim Shusteff, a staff engineer at the Livermore lab. "We hope this will open the way for many other researchers to explore this exciting technology area."